Gov. Charlie Baker joined HMS faculty members in discussing the opioid crisis and the role physician education must play in fighting it. As health care officials and policymakers nationwide continue to search for ways to slow the death toll from opioid abuse, most agree that education and cooperation among physicians are crucial to the effort. 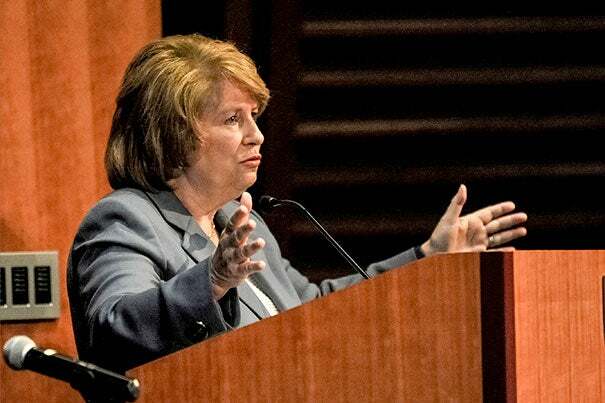 Harvard Medical School is following its own sense of duty with action, Dean George Daley said Tuesday, opening a conference on opioid addiction. 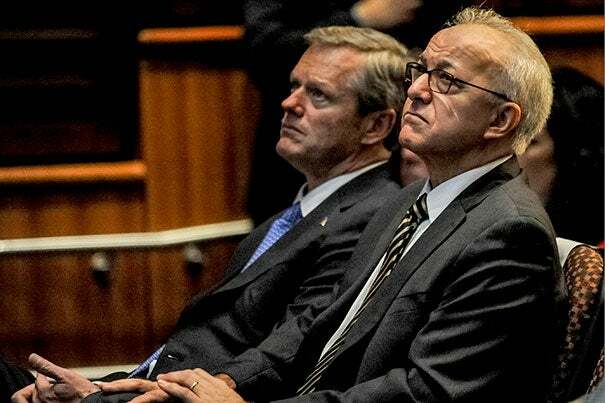 “The Opioid Crisis: HMS Responds with Education” featured remarks by Massachusetts Gov. Charlie Baker and several Harvard faculty members. Baker described his awakening to the crisis during the 2014 campaign for governor. At every speaking event, he recalled, a few people would hang back after his prepared remarks to talk to him specifically about addiction, usually to opioids, which include prescription painkillers, heroin, and the synthetic opioid fentanyl. “When I ran for governor, I didn’t run to work on the opioid epidemic. This is one of those things that found me as a candidate,” he said. Baker asked aides to gather more information on the problem. The statistics that came back were “terrifying,” he said. The U.S., with only 5 percent of global population, consumes 80 percent of the world’s opioids. More than 200 million opioid prescriptions were written in 2014 alone. Further, 66 percent of those admitted to hospitals left with an opioid prescription. Eighteen percent were still using the drugs a year later, and 8 percent of that group had an addiction problem. After taking office in 2015, Baker convened a working group whose report contained some 60 recommendations, most of which the state is working to implement. Key among those guidelines, Baker said, are requirements that opioid education be part of medical training, a focus on wider treatment options in underserved parts of the state, a new monitoring system to track prescribing patterns, and limiting initial opioid prescriptions to a seven-day supply. For the first six months of this year, the state has seen a drop in opioid-related deaths and opioid prescriptions for the first time in 15 years, Baker said. The governor cautioned that synthetic opioids are an emerging problem. Statistics for heroin and prescription opioids would be more encouraging if fentanyl and other synthetic opioids hadn’t arrived on the scene. Bertha Madras, a professor of psychobiology, a physician at McLean Hospital, and a member — with Baker — of the federal Opioid and Drug Abuse Commission, blamed the crisis in part on a shift over the past three decades from fears about addiction to concerns about chronic pain. “We became a nation awash in prescription opioids,” Madras said. Increases in prescription opioid use and addiction helped fuel what Madras described as a “perfect storm” as heroin re-emerged in force and fentanyl became more widely used. She said 80 percent of people addicted to heroin and fentanyl today began with prescription opioids. An important part of the solution, Madras said, is prescreening patients for past addiction to see who might be vulnerable to relapse. Reducing unnecessary prescriptions and expanding treatment options are also crucial, she said. HMS is at work on the education piece of the puzzle in a couple of ways, according to Assistant Professor of Psychiatry Todd Griswold, director of medical student education in psychiatry and a psychiatrist at Cambridge Health Alliance, and David Roberts, dean for external education and the Steven P. Simcox, Patrick A. Clifford, and James H. Higby Associate Professor of Medicine. Given the role of prescribing habits in fostering the crisis, medical schools must make it a priority to improve physician education, Griswold said. He described HMS curriculum changes that integrate pain management and substance use issues into each course, so medical students understand that addiction is not merely a side issue. “Medical schools have a solemn responsibility here,” Griswold said. For working physicians and other medical professionals, HMS has created free online courses offered through its Global Academy platform, Roberts said. The three courses contain 24 hours of material. The School has also created a HarvardX course on opioid addiction.